After a few weeks of sheer indulgence, I am now on a health kick. It’s time for soup (sorry if you’re not a big fan of soup, there’s a couple of posts coming your way). I’m taking a break from the pasta and bread (it’s hard for me to even write that, especially considering I’ve had pizza twice in the past 4 days), and it’s vegetables and proteins all the way. You see, scoffing half a dozen scones, and some muffins, plus the general day to day carb overload my diet consists of, you start to feel a little sluggish. Avoiding outdoor activity because there’s a storm outside doesn’t help either. Who am I kidding, I haven’t done outdoor activity since... um... hrmm. I bought a new book a month or so ago – 100 Best Fresh Soups. Pretty good book too. 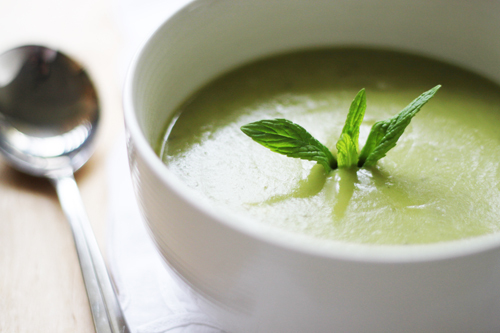 There’s a couple in there that I’m really keen to try out, the Mint, Pea and Yoghurt soup was one of them. I love peas. And mint. And yoghurt. It’s no surprise that I really liked this soup. I followed it quite closely except for the 300ml of milk and tablespoon of cornflour they added at the end. I wasn’t sure about that, and after adding the yoghurt I felt it was creamy enough. Try the milk if you’re up to the challenge. I also chose not to blend the ginger. I could smell the intense flavour it brought just after the boiling part that I decided to take it out. I was left with a nice subtle hint of ginger. Good decision I thought. Heat the oil in a pot over a medium heat. Add the onions and potato and cook until onion is translucent and soft. Add the garlic, ginger, coriander, cumin and flour, and stir so all ingredients are mixed well. Cook for a further minute – this will cook out the raw flour taste. Add the stock, peas and mint and bring to the boil. Reduce the heat, then continue to cook on a gentle simmer for 15 minutes or until the vegetables are tender and cooked through. If you like a subtle ginger taste, remove the slices from the pot and discard. Process the soup in a blender / food processor. Pass the soup through a sieve, return to the pot and season with salt and pepper. Add the yoghurt and stir, and then bring back to the boil. 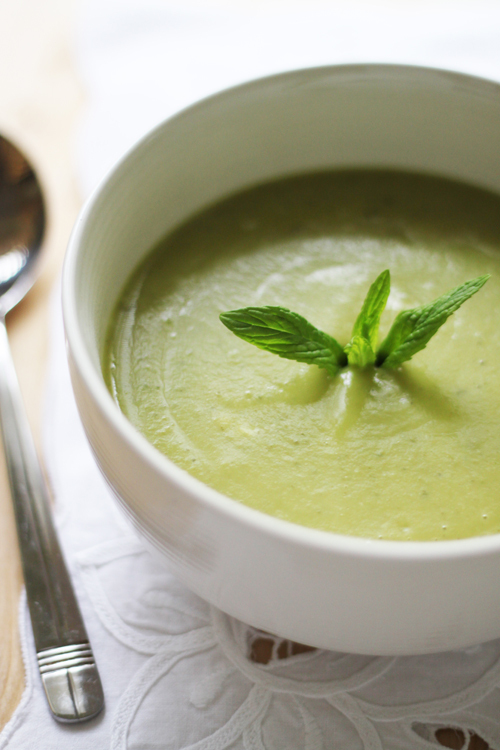 it's the perfect weather for soups at the moment and this looks divine. On the must try list. Thank you all so much for your lovely comments! I'm so pleased that you're enjoying my blog! Yay! such a great blog! Love cooking, you'll be a great reference for me!